Decked out with yellow, red, and orange you will be climbing to the top of the fire only to slide nearly 18 feet with a BUMP to land in a nice relaxing pool of water. Perfect for those HOT summer days! 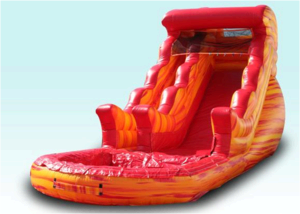 Our 18' Volcano Water Slide slide is made with lead free vinyl and is fire retardant, it has a safety step so that the players don't get hurt scrambling to get on to the slide and anti-jump netting at the top of the slide to prevent falls and unsafe behaviors.